In humanitarian crises, the immediate focus is often on providing food, shelter and medical treatment to those in need. But in Kenya’s Dadaab refugee camps, there is a small but concerted effort to help treat the psychological trauma suffered by refugees who have fled a lifetime of conflict. In the Doctors Without Borders hospital at the Dagahaley camp in Dadaab, Kenya, clinical psychologist Bethuel Isoe-Nyachieng’a tries to calm an hysterical patient who has recently arrived from Somalia. His name is Abdi Ibrahim, a 21-year-old who, until just a few weeks ago, was perfectly normal. His brother explained that Ibrahim began complaining nearly five months ago of worsening headaches and body pains. During the journey to the Dagahaley camp, his condition suddenly deteriorated. One night, Ibrahim woke up screaming and trying to remove his clothes. This is the first time Isoe-Nyachieng’a has seen Ibrahim, but at first glance he believes the young refugee’s illness has been triggered by some sort of post-traumatic stress. On their way to Dadaab, Ibrahim and his brother were robbed by bandits, though neither would explain exactly what happened. Ibrahim’s brother says Ibrahim has lately acted very violently, forcing him to bind Ibrahim’s hands with a lock and chains. The chains do not shock the psychologist, who says he sees them quite often in his work around the camps. The imprisonment of refugees with mental health issues is a stark reminder of the need for a more comprehensive approach to treating victims of famine and war. While chaining victims of trauma and mental illness seems cruel at first glance, many families in the camps do so out of concern for their suffering relatives. VOA witnessed one woman suffering from schizophrenia who had been chained to her house by her brother. The brother said the woman would regularly wander off from the house into the Dagahaley market and had been raped multiple times without being able to defend herself. She was chained, said her brother, in order to protect her from further abuse. And for those without serious mental illness, the public nature of the camps often prevents victims of trauma from recovering without the help of mental health workers. Janet Ndoti-Ndila is a counselor for CARE International at the Dagahaley camps. Ndoti-Ndila says CARE speaks with over 50 people per day in Dagahaley alone who feel they cannot turn to their family or friends for support. Both CARE and Doctors Without Borders estimate they see around 1,400 people in the Dagahaley camp alone. While the CARE counselors do not diagnose patients, Isoe-Nyachieng’a of Doctors Without Borders says they see a range of problems from depression and anxiety to schizophrenia, bipolar disorder and manic depression. Perhaps the most common is post-traumatic stress disorder, which the psychologists say many suffer from the harrowing journey across Somalia, fighting both starvation and threats from armed bandits and the Islamist insurgent group al-Shabab. But many of the refugees in Dadaab have lived most of their lives in conflict zones, and for some psychological trauma goes back years or even decades. In one section of the Dagahaley camp, a family of refugees from Ethiopia had two members who suffered torture at the hands of soldiers years ago. Siyad Abdi Ali was just 16 when he went out to herd his family’s livestock. His mother, Fatum Mahmud Mohamed, explained that he was found days later, chained to a tree with severe injuries on his arms. His mother says he was tortured by the Ethiopian troops who regularly harassed the villagers in their area. In the eight years since the incident, Siyad has never fully recovered. Mohamed says she must keep him chained otherwise he becomes violent and destroys property. Ibado Mahmud, 50, at the Dagahaley camp in Dadaab, Kenya. 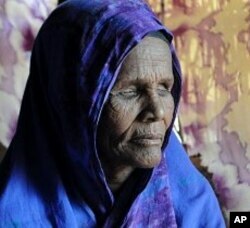 Mahmud had her eyes removed by Ethiopian troops before travelling to the camps. Doctors believe she is suffering from post-traumatic stress disorder. Ibado Mahmud is Siyad’s aunt. The 50-year-old woman was beaten and had her eyes removed with a knife by Ethiopian troops during an attack on her village four years ago. Mahmud said her sons were killed along with many other people in her village. Unlike Siyad, Mahmud has not been restrained by her family, and appears able to function independently, but psychologist Bethuel Isoe-Nyachieng’a told VOA both have been suffering from acute forms of post-traumatic stress disorder for years. They only recently began to receive treatment from Doctors Without Borders, after arriving in Dadaab around seven months ago. Many of Dadaab’s residents have similarly disturbing stories. Isoe-Nyachieng’a says more must be done to address their problems. There are only a handful of mental health officers to address the needs of the people in each of the three camps - a population pushing 400,000. With so many other pressing issues, psychologists within the Dadaab camps will continue to do the best they can with the resources available.